Still image from a video of a Common Raven stripping fur off of a coyote.Courtesy Twin Cities NaturalistA motion activated camera captured remarkable still images in Northern Washington County, Minnesota this week. The camera was set up on a dead coyote in hopes of discovering what scavengers would come eat. Raccoons and crows were not unexpected but it was exciting when Common Ravens showed up on the photos. Northern Washington County is right on the edge of the breeding range of Ravens and simply seeing them during breeding season is an exciting sign they may be breeding. The photos went even further than simply showing the ravens were present however. 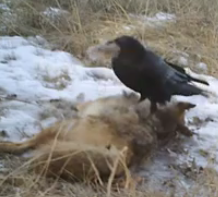 What the series of photos which were complied into a video clearly show is a raven stripping the fur from the coyote and then carrying it away. Ravens are known to line their nests with animal fur so this is a clear indication these birds are nesting.